It’s the first day of Piuraagiaqta today. It’s Barrow’s Spring Festival. I was sort of stuck in the office working, but it was a gorgeous sunny day, with ice crystals hanging in the air. 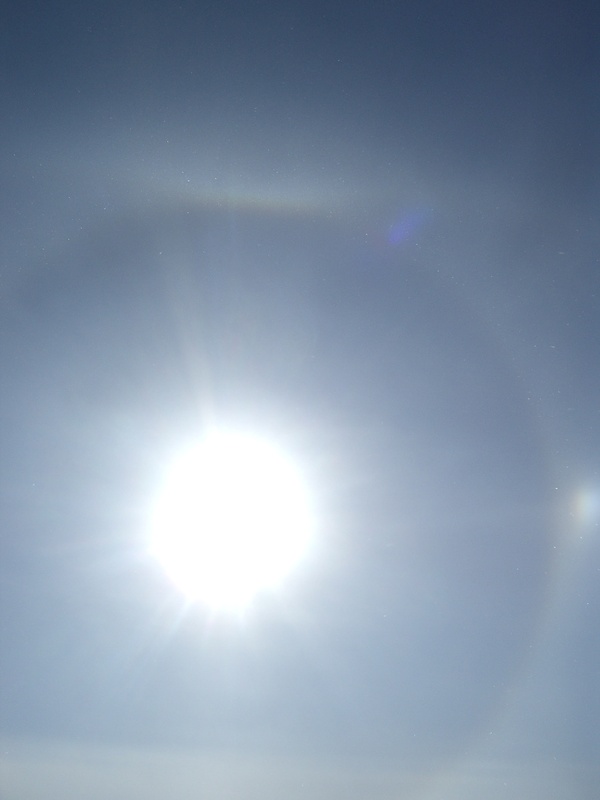 I looked up during the afternoon, to see one of the best ice halo displays I have ever seen. I didn’t have a camera with a wide-angle lens, so I could only get part of it in one shot. Ice halo over Barrow, showing sun with 22º halo, parhelic circle running through the sundog, and the lower tangent arc on the horizon. 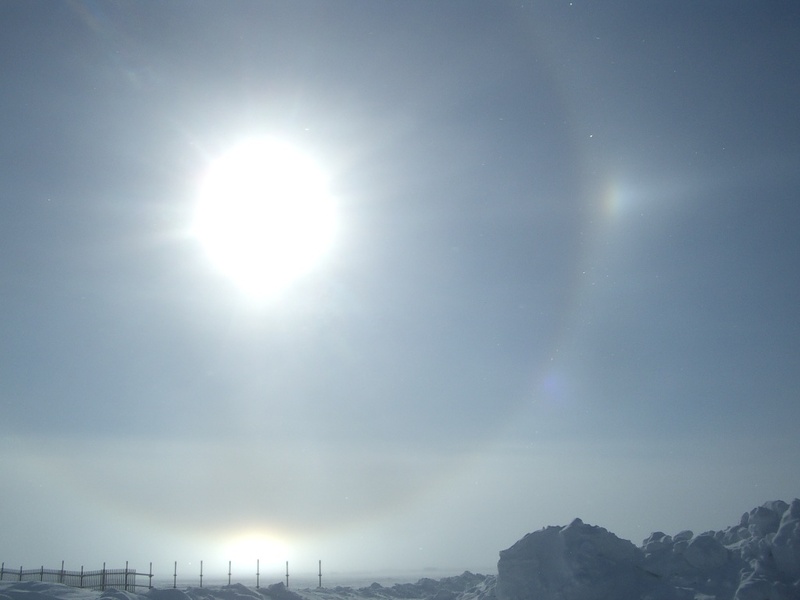 Ice halo, showing sun with 22º halo, a parhelic circle through the parhelion (sundog), and an upper tangent arc. Then my camera battery died. I didn’t get a good picture of the outer 46º halo. The whole display looked a lot like the Parry 1820 display. But just then, as I was turning to go back inside in disappointment, I heard a snow bunting singing! I couldn’t see him, but he was there, and so I know spring is too. 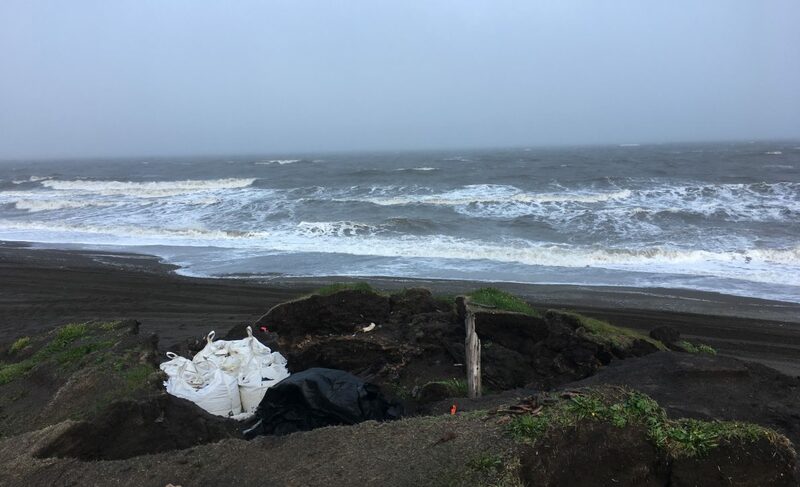 Posted on April 9, 2011 April 9, 2011 by Anne JensenPosted in Arctic, Barrow, environmentTagged Arctic, Barrow, ice halo, parahelia, snow bunting, sundog, weather. If one hadn’t seen it, one might not believe it, eh? Amazing, the beauty and complexity of something created by nature. And it’s free 🙂 Thanks for sharing. I was just sorry I didn’t have the wide angle, although even that might not have been enough.